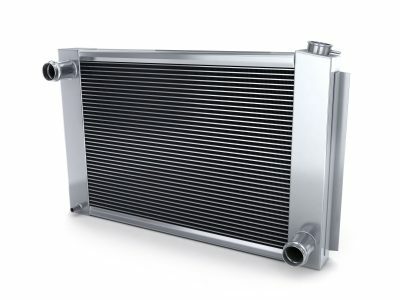 If you’re looking to replace a radiator you must have a pretty significant problem with your cooling system. The only two reasons to replace a radiator is if you’ve got one that is clogged or inefficient, or if it’s leaking. Your radiator is the most fragile part of your cooling system so it is not uncommon for it to become inefficient and not cool your engine properly. Your radiator has tiny fins all along its surface to aid in heat transfer by increasing the surface area of your radiator. These fins do a great job cooling your engine, but they do not stand up well to road debris or other impacts. Even the gentle nudge of the end of your wrench while doing other work near your radiator is enough to bend these fins. Bent fins keep air from flowing through that part of your radiator and can quickly reduce its efficiency. If you think you’ve got a clogged radiator, you may not need to replace your radiator at all. Clogs can come from debris and wear products in your system, but can often be removed by performing a simple radiator flush. You can confirm you’ve got a clogged radiator using a non-contact thermometer and measuring the temperatures at different points in your radiator. If you find a cold spot in the middle of a tube, then there is likely a clog there. If you’ve got a clogged radiator, check out our article about how to flush a radiator to see how easy it can be! The other common reason to replace a radiator is if you’ve got a leak. Before you purchase a new radiator, make sure that the leak is actually in your radiator and that it’s not a repairable leak. Often times, radiator leaks can actually be caused by bad radiator hoses. Before replacing the radiator, check the hoses and clamps to make sure they’re in good condition. The hoses should feel firm (make sure they’re cold before touching them!) and the ends should be in good condition, not cracked or swollen. The clamps should be rust free and tightened and at least ¼” from the end of the hose. You also should make sure that the radiator leak you have is not a repairable leak. Sometimes, when your radiator springs a leak it is catastrophic and requires replacing the entire radiator. An example of this would be a broken pipe or a severely cracked end tank that allows the radiator to empty quickly and your car overheat. Slower leaks, like a leak from one of the tubes or a small end tank leak, can often be quickly and easily sealed from the inside out. BlueDevil Radiator and Block Sealer is specially formulated to seal these types of leaks in your cooling system. Sealing a leak in your radiator can save you a lot of time and money! For more information about BlueDevil Radiator and Block Sealer, click on the banner below! If it turns out your radiator can’t be flushed or repaired, you may need to replace your radiator. In that case, it’s often a relatively simple job. To start, place a drain pan under your radiator and drain all of the coolant from it so it is safe to remove. Before removing your radiator you’ll need to remove the fan and shroud. If you’ve got a mechanical fan, remove it and the fan shroud together. If you’ve got electric fans you can often easily unbolt them and set them backwards towards the engine leaving enough room to remove the radiator. Next, remove the cooling hoses, overflow tank hose, and any transmission cooler lines you’ve got going to your radiator. Now you should be able to remove the radiator clamps on the top of the radiator and simply slide it up and out of the engine bay. Installing your new radiator is the opposite of this procedure, just be very careful not to damage any of the fins on the way in.